or what did psychologists know? Conclusions by Christopher A. 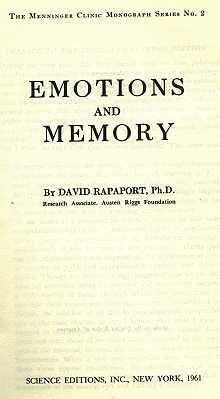 Brown, 2000, from compiled research of the book titled "EMOTIONS AND MEMORY, David Rapaport 1961. The comments I provide at each page, integrate inferentially, the information of "EMOTIONS AND MEMORY" into an application dedicated to understandings of the knowledge of hypnosis and its possible abuses.